The 2011 Harley-Davidson® Dyna® Fat Bob® FXDF is a Dark Custom™ with a big motorcycle feel. 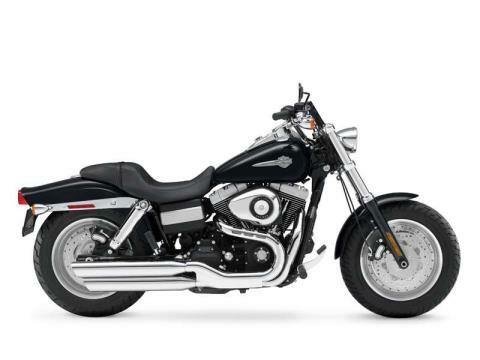 The Dyna Harley Fat Bob features a Twin Cam 96™ engine, providing all the custom Harley power you need. For the custom style you want, the Fat Bob motorcycle's beefy handlebar is truly reminiscent of an aggressive quarter-mile monster. And with the wires routed through the steel, you get a clean, minimal look with nothing standing in your way of the open road. Add to that the wide stance and 16 in. front wheel, and you have a cool fat custom look with a powerful big twin engine. And if you like a little Harley chrome on an otherwise stripped down bike, take a look at the Fat Bob rear chrome shocks. These high performance coil over rear chrome shocks give a smooth ride and custom look. For a little more chrome, the Dyna Fat Bob model also features a distinctive cast chrome double headlamp bucket.